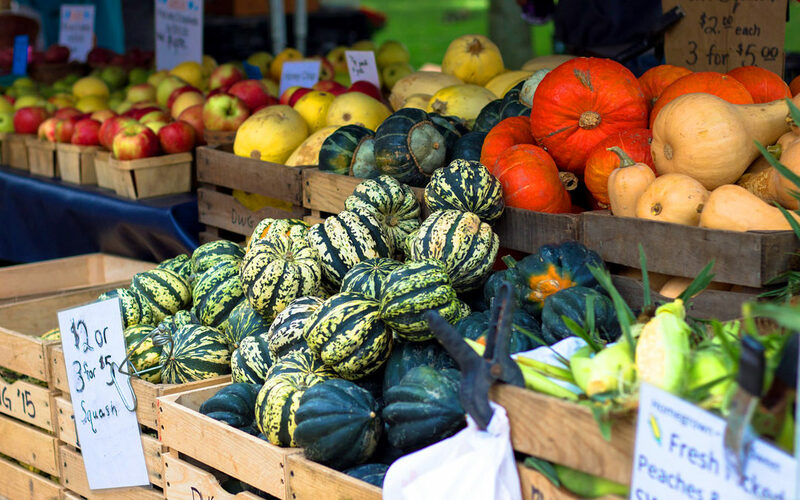 At the beginning of Fall, almost all types of produce are abundant! Take advantage of the cheaper and crazy juicy tomatoes, red bell peppers, and eggplant! Roots like beets, carrots, potatoes and parsnips are at peak harvest time… and lowest price of the season. And what to say of the arrival of those lovely little Brussels sprouts? If you haven’t learned to love them yet, try sautéing them with just a touch of maple syrup. Oh my! It’s time to get reacquainted with the garden giants: squashes. Butternut, acorn, and spaghetti squashes shine in soups and roasted whole or in pieces. And those sweet pumpkins make the tastiest treats. And don’t forget the fruit! They make great toppings for bowls and salads, melt into fabulous sauces, and many are delicious grilled or roasted. Think apples, figs, grapes, peaches, pears, persimmons and pomegranate. Daily themes: By setting a theme for the day and giving you a choice among classic dishes, the template narrows down the range of options and helps you decide what to feed your household this week. Notice that the early days of the week showcase all the fresh produce you bought on the weekend while later days rely on more cooked dishes, some of which you will dig out of your freezer. 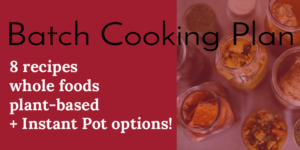 Kitchen inventory: Aside from saving you money and preventing waste, starting with what you already have makes it easier to decide what to prepare. Picked up plump eggplant at last week’s farmers’ market? Time to make ratatouille! Bought a bag of buckwheat groats but not sure you like them straight up? Throw a handful in every time you cook quinoa. Nobody will notice and it’s a source of iron. Advance prep: This is the keystone of smart vegan kitchens. If you want to banish cookbooks and knives from weeknights and still eat varied, delicious and home-cooked meals, you have to do the work at some point. Setting aside two to three hours on Sunday, after getting your groceries for the week, to cook and bake will save you a ton of time and stress later on. If you only have an hour, you can still mix dressings, chop some onions and bake a double batch of banana muffins. It’s the single best investment you can make for your health and enjoyment. Whether you are stuffing bento boxes, filling thermal jars or pulling a quick salad together at home, you can write down what you need to prepare here. Some may be included in your Advance Prep session. Also consider pulling meals out of the freezer. For example, if you have a thermos, it’s easy to pack some tofu-noodle soup of a lemony lentil stew. And breakfast? Call me boring, but I believe in the most routine breakfast possible. There just isn’t time to cook a hot meal in the morning at our home, and chances are there isn’t at yours either. You will still need to jot down some basic staples on your list, such as bread or fresh fruit. Notice how small the box is? Unless you are just starting out (or over) in life, it’s unlikely that your pantry is actually empty. Did you also check the fridge for a bottle of some obscure condiments you purchased for a special recipe three months ago? Make sure not to add items here that could be substituted with items from your inventory. 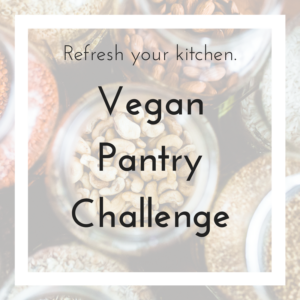 Filling this box as you plan your meals for the week, check the recipes (if using) and jot down the ingredients that you don’t already have. Pick seasonal and local whenever possible. Organic is bonus. Add weekly staples that you eat for breakfast and snacks, along with lunch items. When you are finished planning the whole week, do a quick review of the list to make sure you haven’t forgotten anything. Snap a picture of the box as a grocery list and you are done! 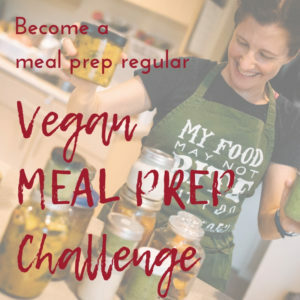 Help yourself to this vegan meal plan template by entering your email address below. It will be delivered to your inbox straight away. 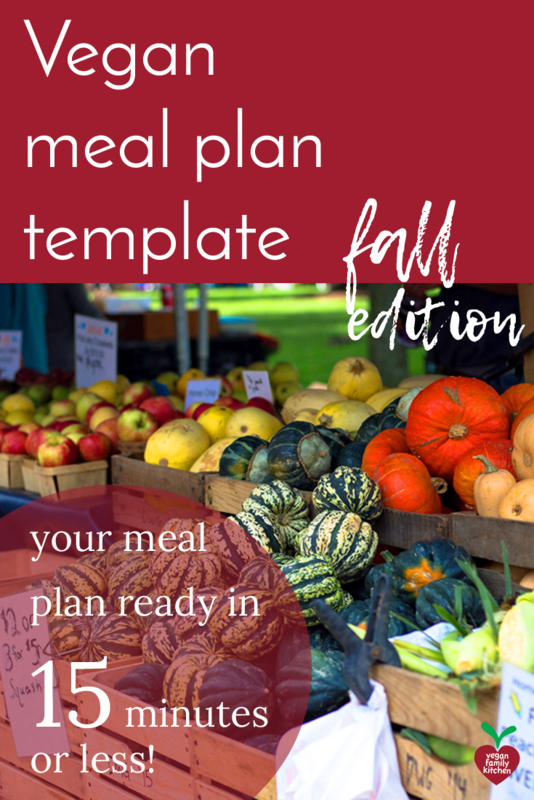 You are only a few minutes away from next week’s meal plan! You will also hear from me a few times a month with strategies to feed your family more vegan meals. Unsubscribe any time. Great! Check your inbox for the template (and your spam box, if it's not here right away).